I began reading at the rather early age of three and started getting serious about it at five. 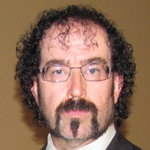 I read Jules Verne and J.R.R. Tolkien at six and quickly fell in love with Science Fiction and Fantasy offerings. My first two Ursula K. Le Guin books, Rocannon’s World and The Left Hand of Darkness, joined the growing throng when I was seven. As I read The Left Hand of Darkness for the first time, I began to experience a desire to write such tales myself someday and perhaps meet a great writer like Ursula Le Guin. I had no idea that I would realize the second of those dreams 43 years later in Portland, Oregon. 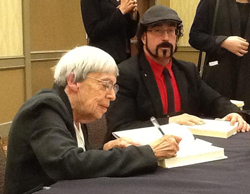 Ursula Le Guin (Left) and Robert "Chaos"
On the 21st of March 2013 at 2:30 in the afternoon I was privileged to meet the idol of my childhood, arguably the greatest female Science Fiction writer of all time. More than this, I and fellow Student Leader Joe Nelis acted as liaisons to Ms. Le Guin and introduced her to a packed ballroom at the Portland Hilton. As I listened to Ms. Le Guin’s presentation and the question and answer session which followed, the impact of her writing and writing style on my own writing efforts hit me like an iron-clad punch. Every statement she made about her practice of our noble craft mirrored my attitudes and practices precisely. In a moment of epiphany, I suddenly realized Ursula Le Guin has been the single greatest influence on my writing to date. As it turns out, she is not my idol, but my mentor. In the short time I spent sitting next to Ursula, as she prefers I address her, during the book signing portion of the event, we became a little more than acquaintances. She scolded me for presenting the wrong title page to sign, and we chatted amiably between signatures. When I slipped my own book in front of the weathered hand that had penned so many masterpieces, she saw the little Post-it note bearing the name Chaos. She looked over at me and said, “There can’t be two of you.” I told her I was shamelessly using my position to jump the line. 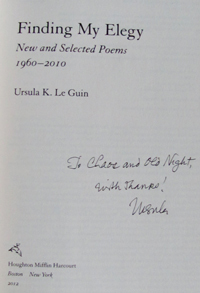 She grinned and signed my copy of Finding My Elegy, “To Chaos and Old Night, with thanks! Ursula.” The reference to Milton’s Paradise Lost was not lost on this old poet. I have never been more honored. Ursula and I have corresponded by email several times since the convention, and I now count her among my most cherished friends. She recently asked me to send her some of my poetry, the better to get to know me. I was stunned at the request. How could that wide-eyed little boy of seven have ever known that at 50 years of age his favorite author would want to read him? There are no words fit to describe such an incredible honor. Sometimes, it seems, dreams do come true.